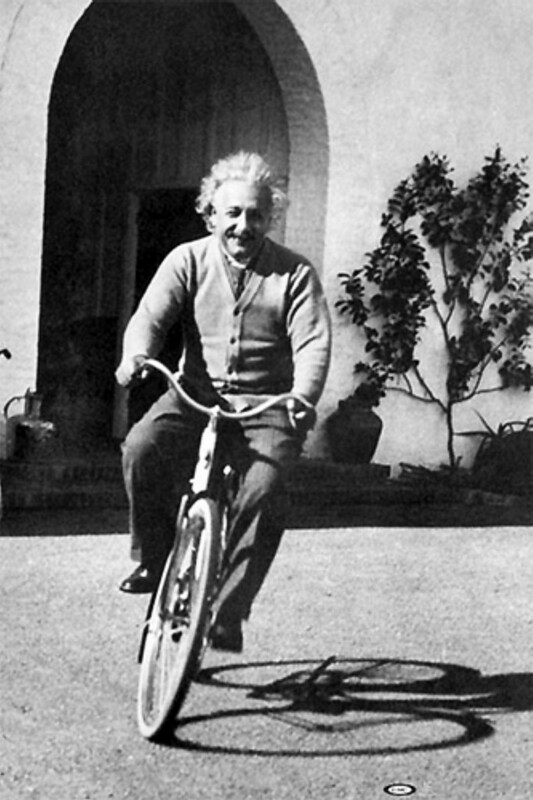 There will be lots of celebrations of the bicycle in the coming four weeks because May is National Bicycle Month. 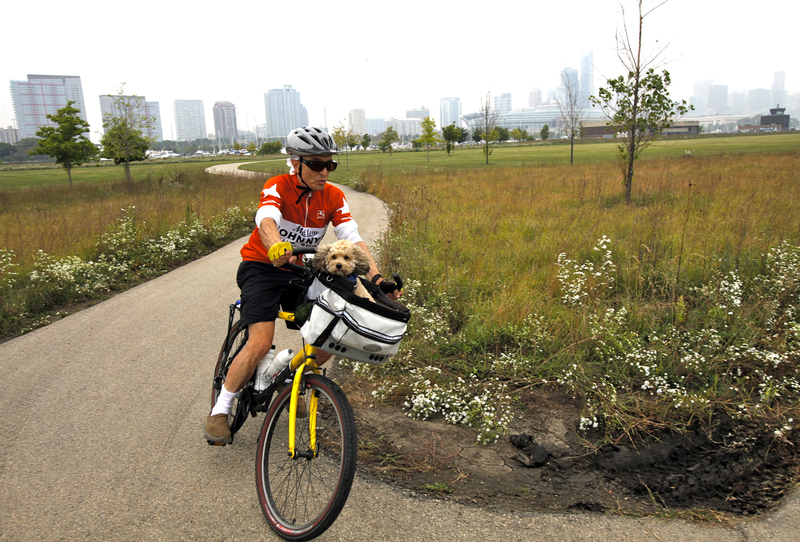 As regular readers know, I ride more than 100 miles a week here in Chicago, all year ’round. So cycling is a labor of love for me. I have tried to explain to myself first, as well as others, why I love to ride my bike. Until recently, the best I could come up with is that I feel like I am flying. Not soaring high, just flying along several feet above the bike path. I know that when I ride, I am at once totally in the moment of propelling the bike forward and at the same time I experience a very enjoyable feeling of expansion – an almost out of body sensation. As a daily bike rider here in Chicago, I was thrilled to learn of the advancements for cyclists overseas reported by Harvard. Solar-powered bike paths that can melt snow and ice; pollution-eating vacuum towers near bicycle paths; bicycle parking stations with lockers, rest rooms, and showers; and bicycle wheels with rechargeable batteries that help propel riders up hills are just a few of the 70 innovations—some already in place, others still on the drawing board—outlined in a new compilation of inventive ideas aimed at encouraging people to bike. “Promoting Bicycling Through Creative Design: Innovations for Bicycles and Cycling Facilities” was compiled by Anne Lusk, research scientist in the Department of Nutrition, in partnership with the U.S. Environmental Protection Agency and the League of American Bicyclists, with support from the Helen and William Mazer Foundation. In a podcast, Lusk talks about ways to make biking safer and easier. Must confess my bias here. I ride so I love this infographic and wanted to share it with you. If you also ride, you may also dig it. If you aren’t a rider, perhaps it will pique your interest. Older people who are highly fit, such as recreational cyclists, are physiologically more similar to young people than to more sedentary seniors. That’s the conclusion of a new British study that sought to explore the effect of physical activity on key indicators of aging. As one scientist put it, “Being physically active makes your body function on the inside more like a young person’s.” So reports Tufts Health & Nutrition Letter. Must confess I feel very gratified reading these words as they confirm most of what I have written in this blog for the past five-plus years. 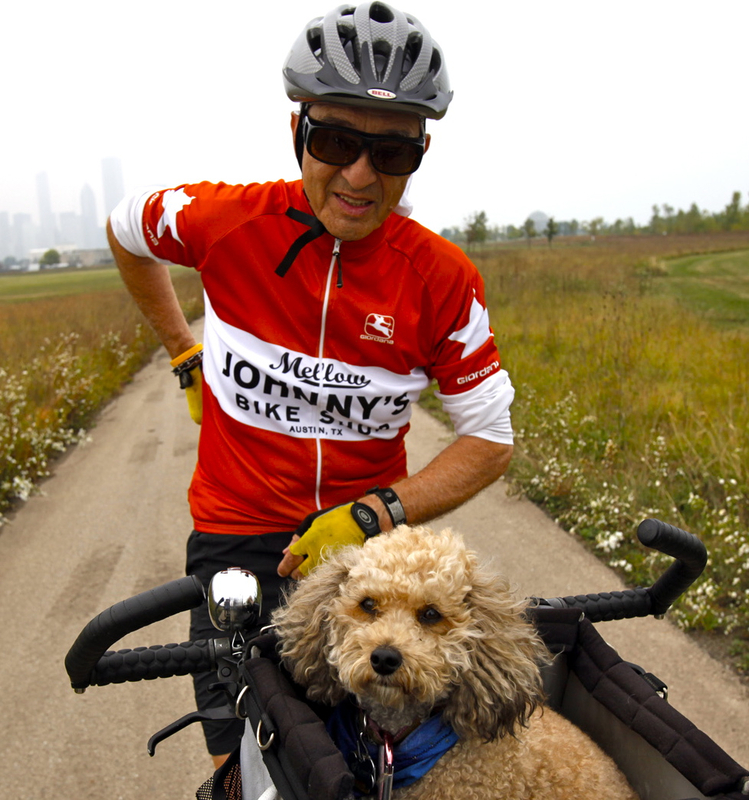 My dog Gabi and me riding on Northerly Island on Chicago’s lakefront in a past summer.